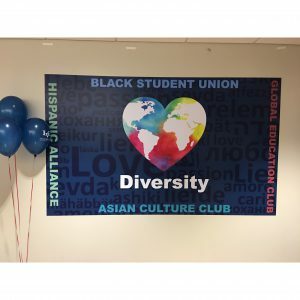 The Black Student Union, Hispanic Alliance, Asian Culture Club and the Global Education Club worked together to create a Unity Mural displayed in the basement of Mund College Center. The Mural was revealed to the LVC community on Monday, Jan. 21, as part of LVC’s MLK Week of Service. Select members of the Black Student Union, Asian Culture Club, Hispanic Alliance and Global Education Club worked with the art department to complete this project. The mural represents love, unity and diversity at LVC and has been in the making for several months. Originally Brim’s idea, he feels tremendously rewarded to see his creative idea become a reality. Not only does he believe in the purpose of the mural, but he also believes it will have a lasting impact on current and prospective students at LVC. Jennifer Phung, a senior biochemistry and molecular biology major and former President of the ACC, believes the mural to be a catalyst for current and future students to feel included and able to express their voices on campus. The Unity Mural can be found in the basement of Mund between the Lebegern Learning Commons and the Commuter Center.